What You Need: 1 cupcake; chocolate frosting; orange frosting; Hershey’s Kiss; black string licorice; toothpick; scissors; pastry bag and round tip or just use a plastic bag with a corner cut off. How to Make It: Frost cupcake with chocolate frosting. “Pipe” three concentric circles of orange frosting as shown. Drag toothpick from middle to edge of cupcake, forming a web shape. Do this all the way around the cupcake, 7 or 8 times, but wipe toothpick clean in between each motion. Place Hershey’s Kiss upside down on cupcake (you might want to cut off the end so it will lie flatter). Use scissors or knife to carefully cut off spider “legs” about 1/2 inch long and place four on each side of Hershey’s Kiss. 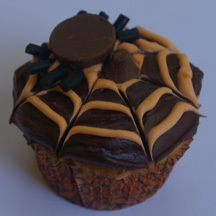 This entry was posted on Tuesday, October 5th, 2010 at 10:57 am	and is filed under Halloween cupcakes. You can follow any responses to this entry through the RSS 2.0 feed. Responses are currently closed, but you can trackback from your own site.